It seems that with the rushing through of the Fake News Bill as well as the passing of the Redelineation Exercise through the final Parliament sitting recently indicate the imminent announcement of GE14. Tomorrow, Friday 6 April, will be a special Cabinet Meeting in the morning moved from Wednesday and is also the final day sitting of the Parliament. Because there was no Cabinet Meeting yesterday, the fuel pump prices remain unchanged. Perhaps, it will remain unchanged until after the next Government assembles because the current BN Government will only be a caretaker after the dissolution of Parliament. On the next day, Saturday 7 April, BN will announce their manifesto and a lot of news breaks have been alluding to the fact that our PM Najib has never announced the manifesto unless he calls for the General Election. As such, tomorrow will be a timely moment for him to do so. The Rakyat of Malaysia has been long awaiting this GE14 as our PM Najib has been teasing since last year but it never did materialize. This suspense has inadvertently hurt the economy because all the anticipation for the GE14 do cause anxiety and suspense to Government and Corporate procurement. And PM Najib is most likely to announce GE14 tomorrow which is much welcomed! 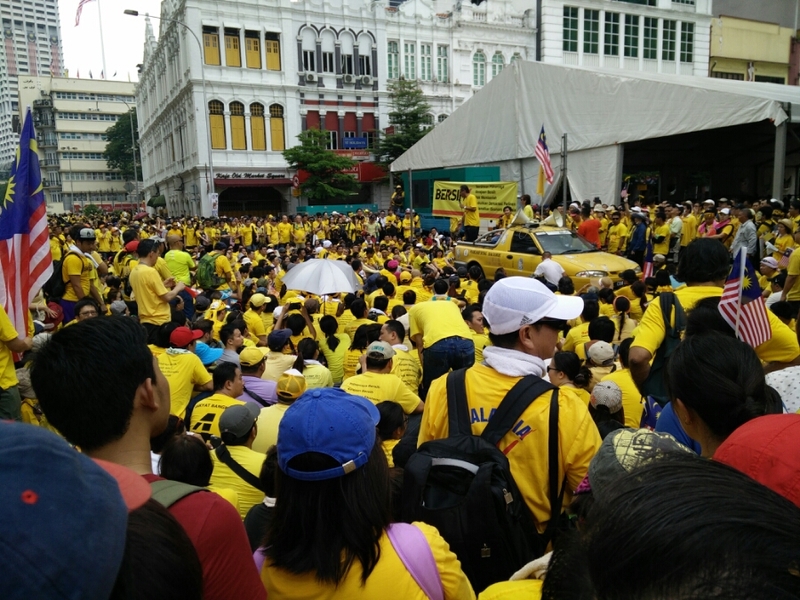 Today is Day 2 of the 34-hour Bersih 4 rally. 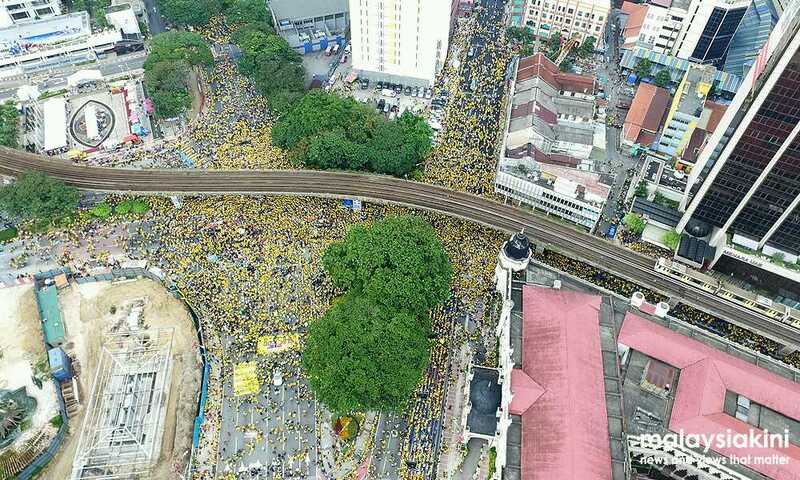 It was estimated that few tens of thousands of Malaysians camped all over the vicinity of Dataran Malaysia. The morning started with prayers of various faiths. The crowd built up in the late morning. Towards the last leg of the program at 9pm, the crowd had swelled to over 100,000 people. Speeches were made by politicians, NGOs and also the public. The atmosphere remained electrifying all the way to midnight when everyone sang our beloved national anthem, Negara ku. Watch the video. The day was hot but it didn’t deter the few hundred thousand of Malaysians coming out to stand up to be counted. Amidst threats by the Police and banning of the Bersih t-shirts, Malaysians were fearless to defy the senseless attempt to rock Bersih 4. Here are some highlights from Day 1 on the ground. In an unprecedented move, Tun M did the unthinkable to show up at a street rally Bersih 4 not once but twice in as many days. Today, Tun M took the KTM Komuter together with his wife, Siti Hasmah, along with an old friend, Zaid Ibrahim. FB went abuzz with pictures of Tun M with the people in a train, arriving at the Central Market station at 4:30 pm this afternoon. 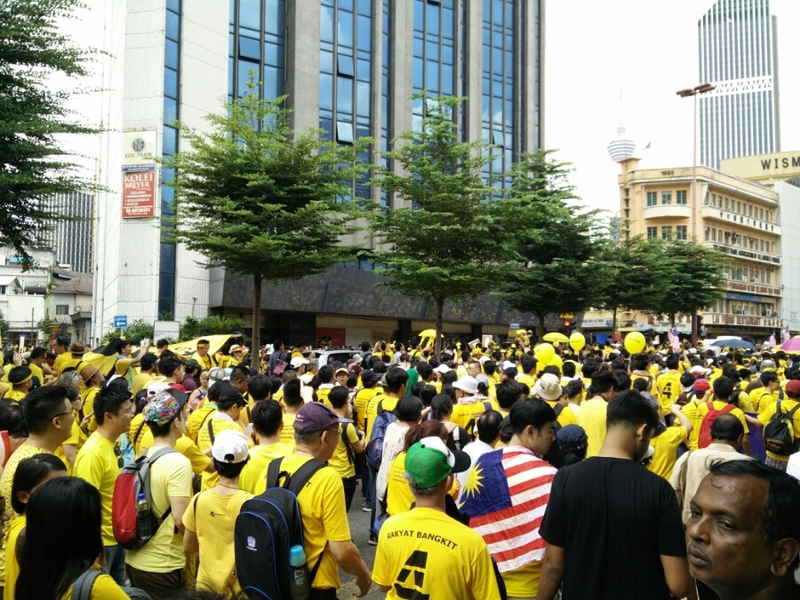 There were certainly an incredible turnout of Malaysians in the Bersih 4 rally thus far. It will be hard to count as this is a 34 hour rally. Many have turned out in multiple locations and many will come at various times. The KL Police Chief says an estimated 25,000 turned up but he will need to go for training to tell numbers in a crowd and willing to tell the truth. There was definitely more than 25,000 but is it 200,000? Not sure but the turnout was awesome and will be scary for some people. 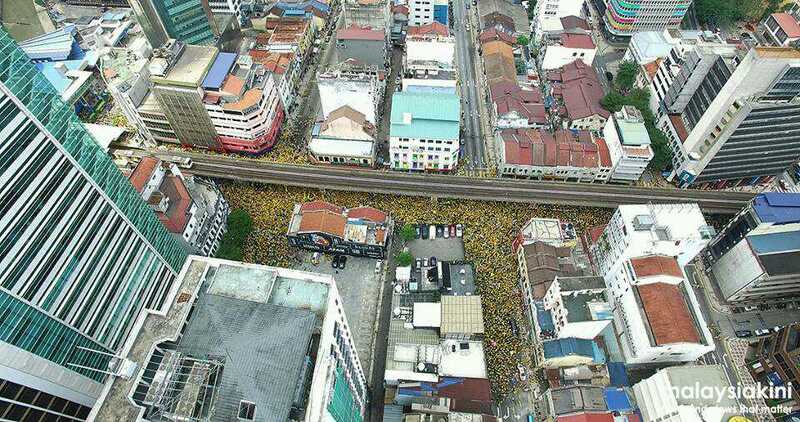 These aerial photos by MalaysiaKini may give us some perspective. At the junctions if Tun Perak and TAR and Raja Laut. At Masjid Jamek area, HSBC building on the left. This is really unexpected and surprising. During his tenure as Prime Minister, Tun M never condoned peaceful assembly or assembly of any sort. This evening at 7:30pm, he and his wife we’re mobbed by the crowd who were elated to see him there. 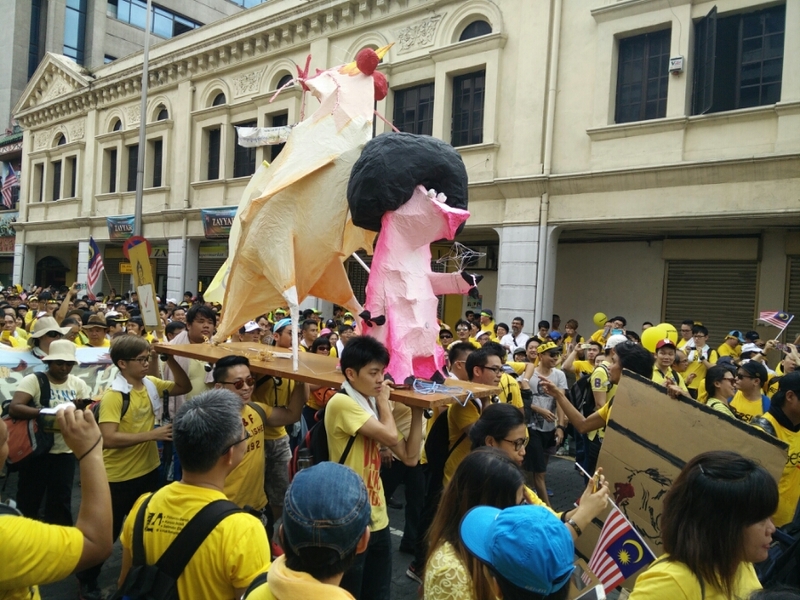 This can present Bersih 4 a big boost if morale and totally frowned upon by PM Najib. They are well respected veterans and Umno members, notwithstanding Tun M being an ex-PM and current instigator to wanting a change of PM. 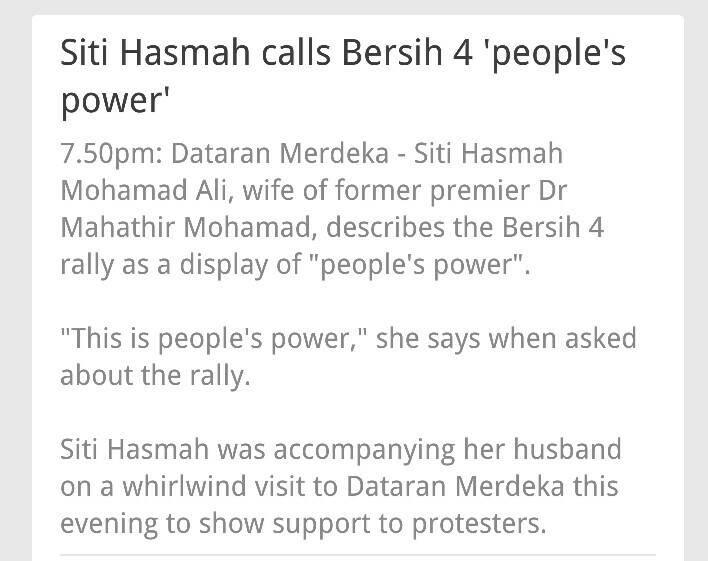 In a rare sight, Siti Hasmah comments that Bersih 4 is “people’s power“. Let’ see how the MSM spins this tomorrow. 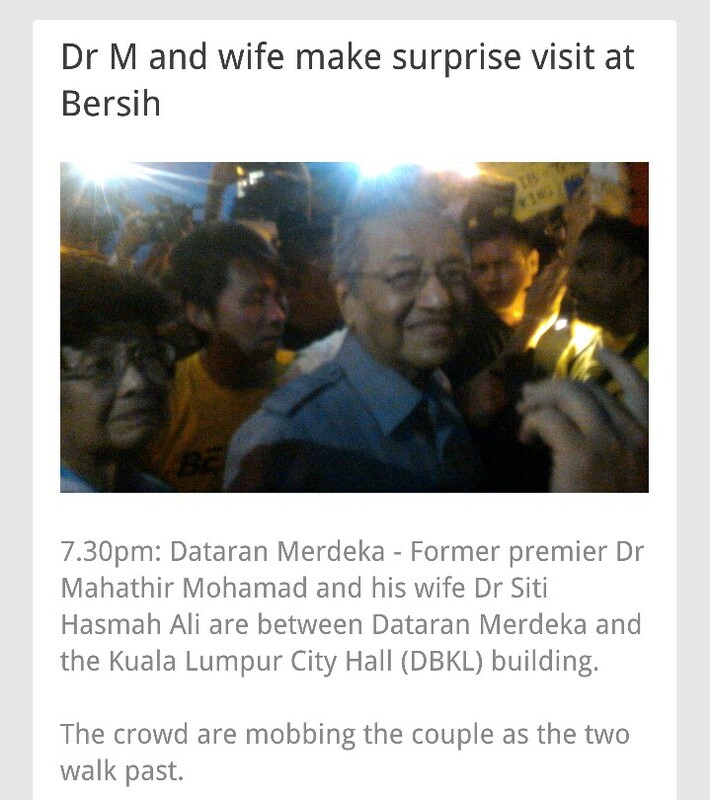 Malaysiakini reported via Prime Streams just now. The time has come for reckoning if this rally will achieve its objectives. Many have made their way to the city regardless how many road blocks were put up by the police. The LRT is most favored to transport people into the heart of the city. They are packed with passengers going to the same stops dressed in yellow. Instructions went out to all participants not to enter Dataran Merdeka or cross any Police barriers. This rally, if the turnout is tremendous, will be the catalyst to major changes in the country as many believes. How and what the changes will turn out to be is left to be seen. 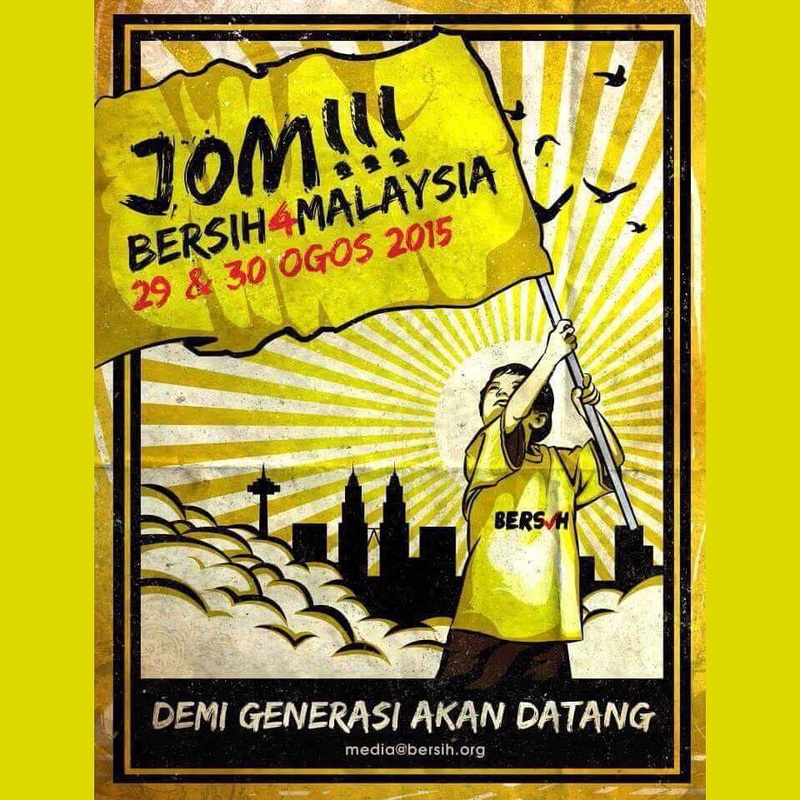 There is another mega rally dubbed Bersih 4 scheduled to be held from 2pm this Saturday 29 August thru midnight 30 August. Gauging from the donation response exceeding RM1.5m and a sell out of 35,000 t-shirts, many people expect this to be an awesome turnout of the rakyat. Certainly, the Police is saying and behaving in the most predictable way declaring Bersih illegal, setting up road blocks and threatening potential protestors of the strong arm of the law, all repeated in each past Bersih rally. There will also be sister rallies across Malaysia and around the world. Thus will garner global attention possibly over reputable media like BBC and CNN. No, the PM will not step down, and that’s for sure. There is no such expectation either. It has been a sad and historically disappointing year for Malaysia. There has been more politicking than focusing on the nation and people. We had to brave not 1, not 2 but 3 losses of airliners, one from Air Asia and two from MAS. Possibly the first and worst in a year for any country to stomach. The loss of lives from MH17 and Q8501 as well as the uncertainty of MH370 whereabouts is just too much for the families and the country to bear. The politicking between BN and Pakatan on a virtually non-stop basis as well as the furious spew of emotional nonsense by Perkasa and ISMA all added to a year of wasted time. The Kajang Move which was to remove Khalid and was stumped by BN to prevent Anwar from taking over the helm of Selangor became somewhat a circus in town, ending up with political turmoil affecting state and royalty and a totally different candidate. A few days ago, the Malaysia Special Branch gave a public warning on the real and serious threat of ISIS affecting Malaysia anticipated to be done by Malaysian Muslims who were recruited to fight in ISIS against other Malaysians. Malaysia is a country who will not simply give any such warnings because such news may cause upheaval if wrongly understood. What the Special Branch said in a carefully worded interview is a wakeup call for all Malaysians who see ISIS as a threat to our way of life in this beloved country. The analysis is that this threat is so serious now that the Police has no choice but to warn the people ahead of time because if this threat is allowed to be made real, it will be an overthrow of our Government and the people who do not subscribe to their advances. The article was carried by The Sun Daily here.